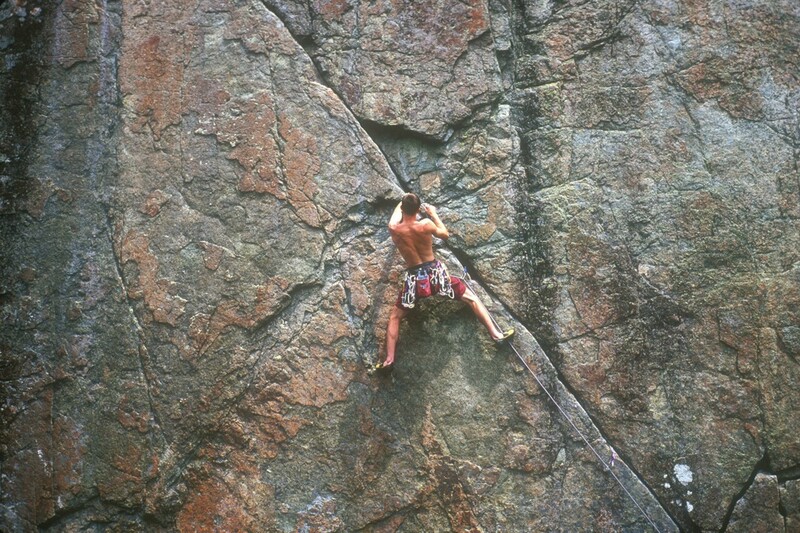 Adirondack Rock's photos, topos, routes, history, and detail are first-rate. It is the ultimate guidebook, and then some—comprehensive, artistic, and innovative. It's not only useful, it is beautiful, and will serve climbers for generations to come. This guide will set a new benchmark in its genre. Its great achievement is that it combines the aesthetic and the practical: being rich in great photos, amazingly precise topos, and loaded with new historical research. In many crags today we see dueling guidebooks. Given the amount of work that the Lawyer/Haas team have put in and the excellence of the result, no rival is gonna draw a gun on them, ever. 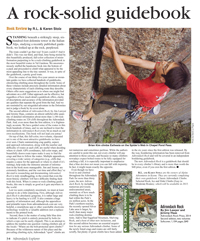 November/December 2014: Adirondack Explorer, "Adirondack Rock: A rock-solid guidebook"
R.L. & Karen Stolz wrote this review for the Adirondack Explorer. Based on their long association with climbing in the Adirondacks, the Stolz's describe the two volume set and some features which differentiate it from other modern rock climbing guidebooks. 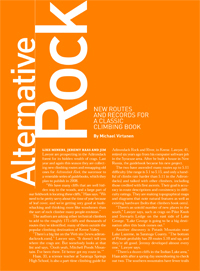 Sep 14, 2014: Adirondack Almanac, "Review: New Edition of Adirondack Rock Superb"
Phil Brown, local climber and journalist, wrote this brief review for the Adirondack Almanac. He describes the expanded coverage of cliffs and routes, and highlights some design improvements. Fall 2014: LOCALadk, "Bringing Forth a Guidebook"
Colin Loher reviews the second edition and describes his experiences working on the book with the authors. It's accompanied by excellent photos by David Le Pagne. Click here for the full magazine. 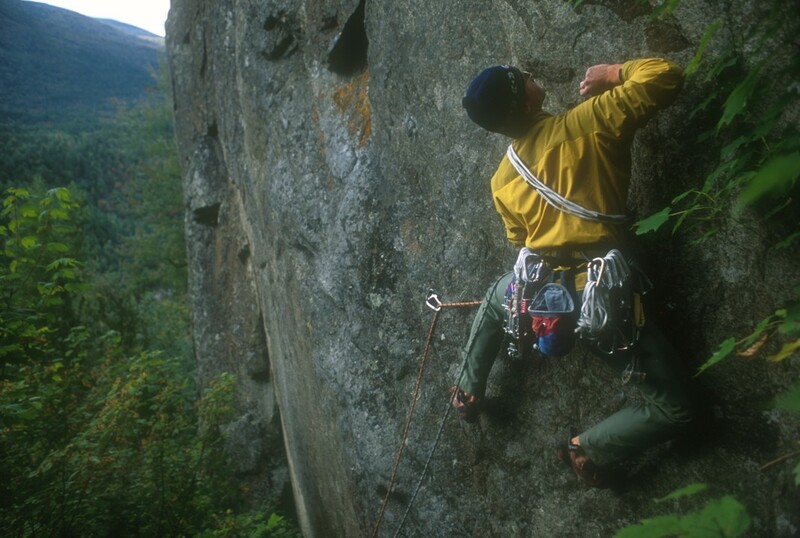 Review by Alan Rubin, "Adirondack Rock Review"
Alan Rubin began climbing in the Adirondacks in the 1970s, pioneering new routes at Moss Cliff and Hurricane Crag. He continues to make climbing trips here to this day. Alan wrote this review of the second edition. Review by Ken Murphy, "Adirondack Rock Review"
Ken Murphy is an avid Adirondack climber who wrote this review. 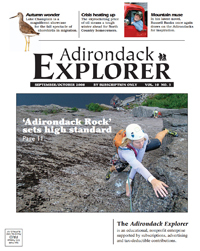 September/October 2008: Adirondack Explorer, "Adirondack Rock Sets High Standard"
Alan Wechsler's comprehensive review appeared as the cover story in this issue of Adirondack Explorer. The cover shot is Emilie Drinkwater on California Flake at Avalanche Pass. Other photos include Brian Kim on Esthesia at the Spider's Web and Sara Councell on Freedom Flight at Poke-O Moonshine. June 20, 2008, "Recent and Current"
R.L. and Karen Stolz run Alpine Adventures in Keene, and wrote a review on their web site. June, 2008, "Where the Wild Things Climb"
A "review" appeared on the Climbing Magazine web site, written by Kristin Bjornsen. 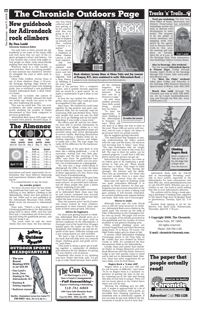 April 17, 2008: Lake George Chronicle, "New Guidebook for Adirondack Rock Climbers"
Dan Ladd interviewed Jeremy and wrote this piece introducing the book. A large photo of Jeremy appeared on the front page, and the remainder of the article appeared on page 32. 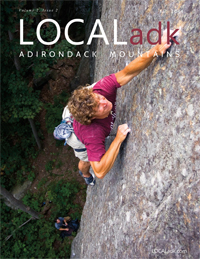 April 7, 2008: Lake Placid News, "New Guidebook Features Local Rock Climbing Spots"
Written by staff writer Heather Sackett, this article announces the release of the book. 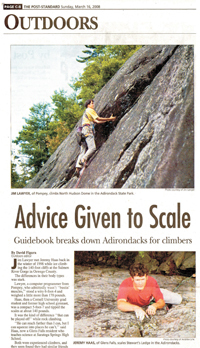 March 17, 2008: Syracuse Post Standard, "Advice Given to Scale"
This is the first bit of press since the book was published, written by David Figura, the Outdoors Editor at the Post Standard in Syracuse, New York. It appeared in Sunday's paper on page C-8. Fall 2007: Adirondack Life, "Alternative Rock"
Michael Virtanen writes about the guidebook project in the cover story of Adirondack Life, in the 2007 Annual Guide to the Great Outdoors (Volume XXXVIII, No. 4). The article featured several photos, including Jim's photo of Chris Thomas on the cover, and a couple of Will Mayo's photos of Creation of the World. September, 2007: Adirondack Explorer, "Partners in Climb"
We spent a day with reporter Alan Wechsler doing guidebook work, hitting Sunrise Mountain and the Brothers (the ridge leading to Big Slide). Alan writes about the process of writing a guidebook with a more personal background. The article includes a couple photos—the authors at the top anchor of the Helms-Jolly route at Sunrise Mountain, and Jeremy Haas climbing at Potash with Jeremy Morgan. It also shows the Creature Wall topo, although it incorrectly credits Dacksdescents Publishing for this. 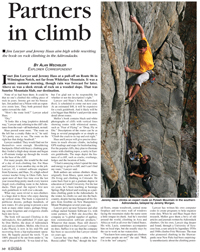 July 20, 2007, Lake George Mirror, "Rock Climbers Now Focusing on Lake George"
Ethan Gaddy writes about his excitement that Lake George areas being documented in the new guidebook. April 1, 2007: New York Times, "Hitting the Wall, and That's Just for Starters"
An Associated Press article describing the book project ran in many newspapers across New York State, including Sunday's New York Times, Sports section (section 8), page 5. 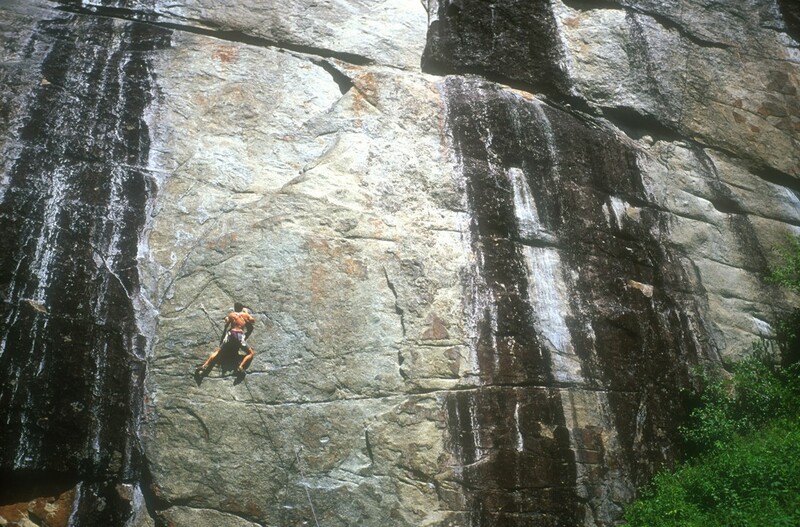 The article describes the emphasis we're placing on the rock climbing history and gives several	examples. The Times article ran with two photos, the top photo is the route Kingdom Come (5.12a A0), and the bottom photo is Creation of the World (5.11c).